Are Baptists Part of the Protestant Reformation? Even while modern day Protestants trace their roots to the Reformation, there are many within Baptist circles that would argue that Baptists are not part of the Protestant Reformation. They would see a distinct difference in origin for Baptists than the Reformation. So, the question must be asked, are Baptists part of the Protestant Reformation? 1) Strict organic successionist view. There has always been a succession of Baptist churches throughout history beginning with the first Baptist church of Jerusalem. Dissenters from the earliest times were Baptists with different names. Early seventeenth century Baptists were influenced by continental anabaptists. The Baptist denominations originated out of the Puritan Separatist Movement n seventeenth century England. There is of course a mixing of these different views but these are essentially the normal views taken. Now, this is a huge topic and one that could be devoted whole books to, but I will refer you to the recent presentation of this material by my former Church History professor here for more details. See him for a presentation of arguments against Baptists being derived from the Protestant Reformation. Briefly though, let me outline a few historical reasons FOR viewing Baptists as deriving from the Protestant Reformation (see Priest for biblical arguments regarding the universal church). 1. The church of Jesus Christ has existed since Pentecost. Just because it is difficult to find historically groups throughout history who maintain a pure commitment to the NT church does not mean they did not exist. Regardless, the purity of the church has been maintained in the universal body of believers, not necessarily always in local churches. This helps us then to not attempt to force heretical groups into a Baptist mold just because they performed baptism by immersion. 2. The Second London Baptist Confession (1688) affirms both the universal and local aspects of the church in article 26, sections 1 and 2. Since Baptists affirm the universal church, this means that it is not necessary for there to be visible manifestations of the universal body in local bodies at every single moment throughout church history. oaths among other things makes a real difference between the two groups. 4. Just because Baptists did not directly come out of the Roman Catholic church does not mean they are not part of the Protestant Reformation. They come out of British Puritan Separatism (which can be demonstrated historically) and therefore, since they derive their origin from the Reformation, so we can as well. 5. The First and Second London Confession of Faith mention that they are not Anabaptists. The Confession or Declaration of Faith by the General Baptists says the same thing. 6. John Smyth inaugurated the practice of believer’s baptism among his Separatist ollowers in 1609. After repudiating his baptism and attempting to merge his church with a Mennonite community, Thomas Helwys, John Murton, and their followers rejected Smyth and returned to England to found the first General Baptist church there in 1611. 7. In the 17th century, when some argued for a successionist view of the Baptist origin they were looked upon with suspicion as it sounded very Roman Catholic. 8. There were many different varieties of Anabaptism in the 17th century, not all of it biblical. Today most Anabaptists have no fellowship with Baptists. This has been rather brief, but it is good to get an overall historical view of something and use it as a jumping off point so that others can investigate the issues for themselves. In conclusion though let it be said that whatever the origins, Baptists have attempted to derive their theology and practice from the New Testament and only the New Testament. Yet, when looking at the historical evidence, it does seem primarily true, that Baptists come not from a long line of succeeding groups, nor from the Anabaptists directly (there may be some influence there) but from the British Puritan Separatists. And they take their origin eventually out of the Protestant Reformation. So therefore, Baptists are part of the Protestant Reformation. If you are a Baptist this day (Reformation Day) take heart and rejoice in what God has done in history to rescue the truths of the Scriptures and bring them back into the church and thank God for the privilege of being part of that Reformation! James Taylor, Pastors under pressure: Conflicts on the outside, fears within (Leominster, UK: Day One Publications, 2004), p. 53. I highly recommend this book for any in or contemplating going into the pastoral ministry! You can buy it here. 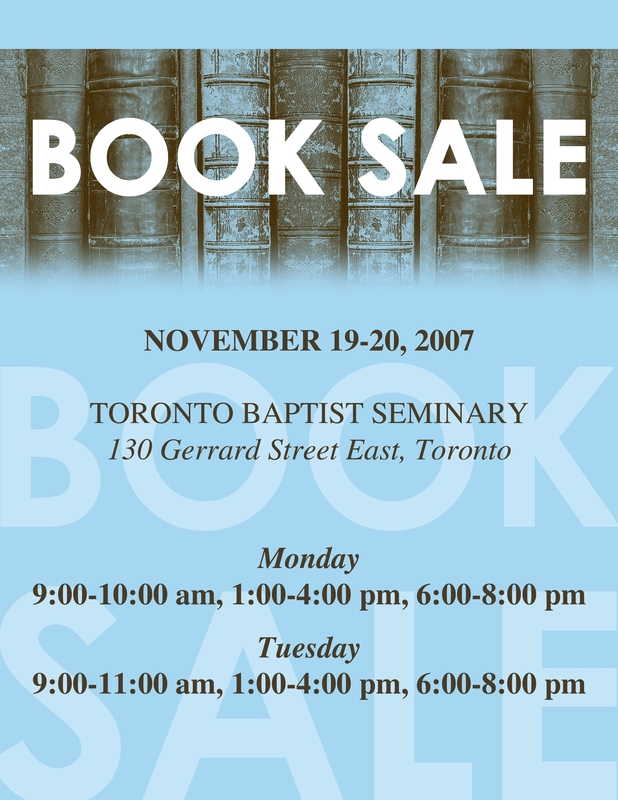 Come one come all to the Toronto Baptist Seminary and Bible College book sale! All proceeds go to the Peter MacGregor Library at TBS. We have been fortunate to receive the entire contents of a solid Christian bookstore as a gift to the school. Most of the books are new and there is some used as well. You will find great deals here on fantastic books! This will include commentaries, theological texts, and other solid reference materials! Only cash or cheque will be accepted. To be held at Jarvis Street Baptist Church (130 Gerrard Street East, Toronto). For more information please phone 416-925-3263 or e-mail inquiry@tbs.edu. Robert Hall, Jr., “On the Discouragements and Supports of the Christian Minister: A Discourse, delivered to the Rev. James Robertson, at his ordination over the Independent Church at Stretton, Warwickshire” in The Works of the Rev. Robert Hall, A.M., 4 vol. (New York: Harper and Brothers, 1854), I:154-155. You are currently browsing the Working out Salvation with Fear and Trembling blog archives for October, 2007.